Et kënnt drop un or Et hänkt dovun of. I don’t want to discuss the differences between those 2 in detail but I think ukommen op is shifted quite a bit towards that is up to … in sense of responsibility or importance rather than choice. Both ofhänke vun and ukommen op are separable verbs. So in a sentence in the present tense you have to put the separable particle of– & un– at the very end of the sentence. How would you say It depends on the situation using both verbs? Et hänkt vum (vun dem) Wieder (n) of. – It depends on the weather. Et hänkt vum (vun dem) Dag (m) of. – It depends on the day. Et hänkt vu mengen Elteren (pl) of. – It depends on my parents. Et hänkt vun dir of. – It depends on you (informal). Et hänkt vun hinnen of. – It depends on them. How would you ask: What does it depend on? Well this is: Wouvun hänkt et of? And to answer that question you’ll have to say Et hänkt dovun of, …..+ subordinate clause. When you point on it you use do+preposition followed by a subordinate clause. Kënns du e Freideg op meng Party? Dat hänkt dovun of, ob ech e Babysitter fannen. Will you come to my party on Friday? That depends on whether I’ll find a babysitter. Wat ëss du am Restaurant? Et hänkt dovun of, wat si op der Kaart hunn. What will you eat at the restaurant? It depends on what they have on the menu. It depends on how late it is. It depends on how much money I have. It depends on where you (plural) live. It depends on at what time they come home. It depends on whether I have a lot of work. 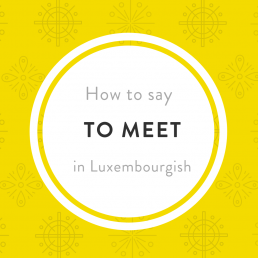 Are you (informal) coming with us this evening? I don’t know yet. It depends on where you are going. Are you (formal) going on vacation in July? We don’t know yet. It depends on when my wife will be on leave. 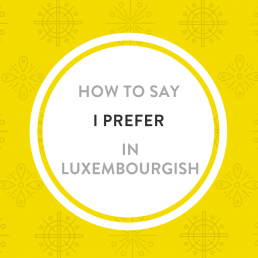 Another very simple way of saying It depends in Luxembourgish it is the short expression Jee nodeem(s). 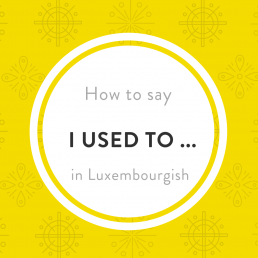 How to say “I used to …” in Luxembourgish?